By default the ADX indicator is loaded below the instrument. The black line represents ADX, ensure it is above 25 while looking for the crossovers. Load the Alligator indicator from the studies. As you can see the default values of the moving averages are loaded i.e 13, 8, and 5. As you can see, the indicator input also loads the ‘offset’ values for each MA. These offset values are also loaded by default values. Offsetting or displacing the moving average reduces the number of whipsaws in the average. Needless to say that you can change the default values for moving average and offset to any value that you deem appropriate. Further you can even customize the color of each indicator to your preference. Here is the snapshot of how the indicator looks when the indicator is overlaid on the chart. Do notice there are 2 instances when the sell condition is satisfied (highlighted in red) and 1 instance when the buy condition is satisfied (highlighted in blue). 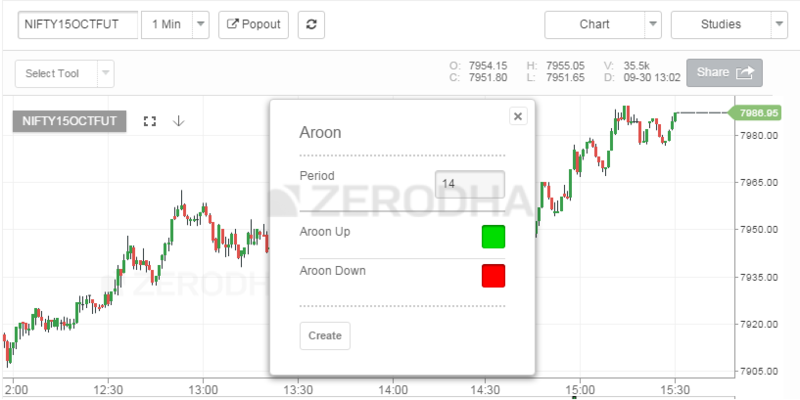 Developed by Tushar Chande in 1995, Aroon is an indicator system that determines whether a stock is trending or not and how strong the trend is. “Aroon” means “Dawn’s Early Light” in Sanskrit. Chande chose this name because the indicators are designed to reveal the beginning of a new trend. The Aroon indicators measure the number of periods since price recorded an x-day high or low. There are two separate indicators: Aroon-Up and Aroon-Down. As you can see the default period is 14, feel free to change this to any number you wish. 14 here represent the ‘number of days’. Do remember if the period is 14, the Aroon measures the number of days since the stock made 14 days high/low. As you can see both Aroon up and Aroon Down are plotted. Aroon Oscillator is an extension of the Aroon indicator. The Aroon Oscillator measures the difference between the Aroon up and Aroon down and plots the difference in the form of an oscillator. The oscillator swings between -100 to +100, with the ‘0’ level as the center point. A reading above zero means that Aroon-Up is greater than Aroon-Down, which implies that prices are making new highs more recently than new lows. Conversely, readings below zero indicate that Aroon-Down is greater than Aroon-Up. This implies that prices are recording new lows more recently than new highs. If these SL levels are outside your risk to reward appetite, the its best to avoid such trade. The ATR bands are an extension of the ATR concept. The idea is to plot an envelope around the stock price to evaluate if the stock prices are behaving “normally” or trending in a particular direction. In order to do this, the ATR band calculates the upper and lower band. Period refers to the MA time frame; the default value is 5 days. You can change this to whichever time frame that you deem suitable. We would suggest you ignore ‘shift’ parameter. For the ‘field’ option select ‘close’, this means to say that you are plotting the MA values on the closing prices. The rest of the options are mainly aesthetic features, feel free to explore them. Once you click create, you will see the ATR bands plotted on the chart. Before understanding the supertrend indicator, understanding the ATR is necessary as super trend employs ATR values to calculate the indicator values. 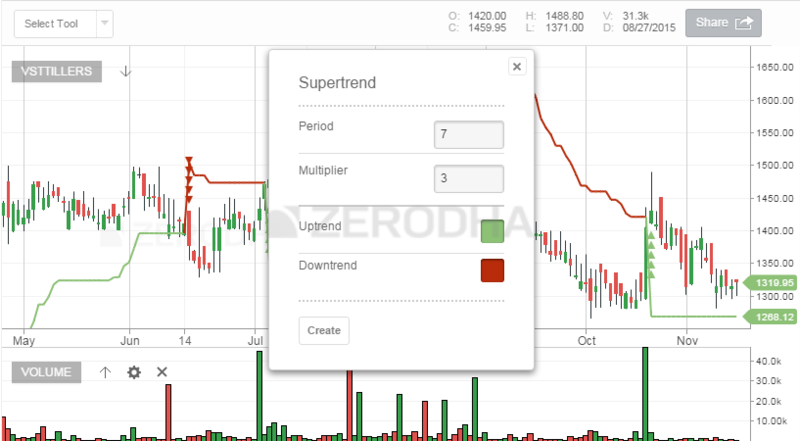 The supertrend indicator is plotted over the price chart of the stock or the index. The indicator line changes its color between green and red based on the price moment in the underlying. Super trend does not predict the direction, rather once the direction is established it will guide you to initiate a position and suggests you to stay in the position till the trend sustains. When you select Supertrend indicator from the list of studies you will be prompted for two inputs – Period and Multiplier. Period refers to the ATR number of days. The default value on Kite is 7, which means to say that the system will calculate the ATR value for the last 7 days. You can input any value you deem suitable. The multiplier refers to a value by which the ATR will get multiplied. The default value on Kite is 3, so whatever is the value of ATR, it will get multiplied by 3. Multiplier is a crucial input for Super trend. If the multiplier value is too high, then lesser number of signals are generated. Likewise if the multiplier value is too small, then the frequency of signals increase, hence chances of generating false trading signals are quite high. I would suggest you keep this value between 3 and 4. Notice how the indicator changes the color as the price moves. Also, whenever the buy/sell signal is generated green and red arrows are generated (respectively) prompting the trader to go long or short on the stock. VWAP is one of the one of the simplest indicators to use. It works on the principle of averaging the traded price in terms of volume traded. Let me give you an example of to help you understand this better. The data is quite simple to understand, for example, at 14:32, 2475 shares were traded, it made a high of 983.95, low of 983, and closed the minute at 983.1. VWAP = We get this VWAP number by dividing the Total VP by Total Volume. The resulting number indicates the average traded price, weighted by volume. As you see, the VWAP is a dynamic number, changing based on how the trades flow in. How to use the VWAP? Note, VWAP can be applied only on intraday time frame and cannot be applied on EOD data. Once you select the time frame (1 min, 5 mins, 10 mins etc), the engine calculates the VWAP and plots it on the chart as an overlay. You can now visualize the VWAP and the current market price and plan your trades accordingly. In the supertrend example, if we would have waited for crossovers to exit, we would have suffered losses(or at least would have lost most of our profits) so is there a better exiting strategy? Maybe in this case, but generally speaking the indicator allows you to capture a chunk of the trend. Larger the trend, higher the number of points you can capture. Changing the components colour is possible?In above screenshots green,red widely used how can i on kite? You can explore the themes in Kite and select colours based on your preference. Not sure if this can be done, Devashish. The indicators come from 3rd party sources and I believe they are hard coded. Let me check this though. Your strategy is good and works well in trending and low volatile market but in range bound market with high volatility it sometime fails. So I feel if we combine it with some other indicators like donchain channel, SMI, the result would be far more better. why SMI and donchain channel are not included in indicators section. Guess this is already available. Did you check under ‘studies’? Sir, can you plz elaborate the above strategy and also plz advise me which indicator from the one listed above should be my priority if i am looking for buying stock in futures. If you are buying stocks, especially for a long-term perspective, I’d suggest you check the moving averages. Hi sir…Sir i have one doubt that…The super trend is Available in PI or Not?…if not..when wil it wil be added..? Its available in Kite for now. Not sure by when we can have it on Pi. Just to add – averaging on your losing trade is not advisable at all. On the other hand, one should look at averaging on winners. What happens when Sell signal appears in 5 mins chart after you have entered into trade looking at buy signal in both 30 mins and then 5 mins. Are you going to square off buy trade or keep it open until new signal appears in 30 mins chart? You should go with the primary time frame – if the decision was based on 30 mins, then its best to stick to the 30 mins time frame. I have tried it but failed badly. lost 27490 in a single trade. It does not give signal in correct direction. nothing is guaranteed. Absolutely, nothing is a guarantee. The only thing that comes close is constant learning and improvisation. Felt sorry for the losses that you incurred. See basically my ideology is take all the primary time frame & trend signal & in case you have missed it then switch to lower timeframe and take the signals equivalent to primary time frame. Hope not confusing ! Also you should have defined risk taking & risk management discipline planned in advance only before trade entry. What I have observed over a period of time, what signal Supertrend gives after 10-15 minutes, the same signal appears in Parabolic SAR 10-15 minutes before. SO you will certainly get much better price than Supertrend. So far, PSAR has been the best indicator ever I have come across. As far as accuracy is concerned, Both Supertrend and PSAR will give same accuracy. But you can catch more points in PSAR. Vipul, when you say “timely profit” and since you trade intraday, can you pls. explain your strategy, with the help of charts ( flashback feature from Q)? how & when you book ur profit or how & when you book ur losses? Sir what is PSAR which is like super trend indicator. Parabolic SAR or PSAR is a series of dots placed above and below the price of the stock, indicating buy and sell trades. This is a momentum indicator. It is much less complicated compared to a supertrend. Try to use Heikin Ashi chart and then use your strategy. Test this on some previous data, and tell if it gives better signals. Vipul – while using 5 mins time frame, do you close out each day before 3:30 PM ? Because I think overnight position could be very dangerous for short time frames. I did not understand how to use supertrend signal . how long to wait for going long on the stock if signal shows green crossover . what should be target and stoploss when using supertrend signal . Anand, have discussed supertrend in detail in the note including all the questions you’ve asked. Suggest you give it another read, thanks. The price at which you intend to book profits and get out of a trading position. Thank you Vipul for this strategy. Sir, What is SMI & Donchain Channel ?. Is it available in pi an in kite ?. Can you elaborate both ?. yup, very soon we will be adding notes on all popular indicators available in Kite. Thanks for this supplement notes on indicators. It is very useful and knowledge gaining too. Will you give such description on other indicators and chart pattern on kite, it would be very helpful. Also. Kite app can also contain all features of web based platform?? We will be adding all the popular indicators in the supplementary notes. Kite App will contain all the features. gr8 article. Can you please explain types of charts & its utilization too? i.e. heiken Ashi, point & figure, range bars, Renko etc. 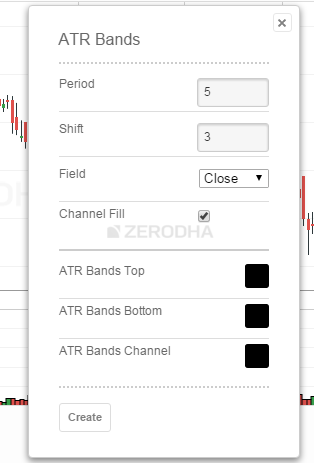 How does Zerodha calculate the size of Renko bar? It is different for each ticker and is the calculations are not consistent with any formula (ATR, 1/20 or 1/25). Can someone provide some insights? I am little confused. Please clear my doubt. In kite, if I place a buy order with no trigger price then it buys at market price but if we give trigger price then buy when price reaches that price. Also if I want to buy at higher price than CMP but only when CMP reaches that price what should I do??? I would suggest you speak to our support executives wrt to order placement queries. Sir, Which is the best period and Multiplier number for Checking Current Super trend for intraday trading, and for positional trading which is the best period and Multiplier number. I’d suggest you stick to the default number. When kite app would launch??? The beta version is out there, you can give it a try. Suggest you speak to our support executives. Hello.. Is the supertend indicator enabled in the pi software.. How to enable the same..
Why pi is not containing ADX ? i need some indicator to use for making short-term equity CNC trades ( i will hold at the max 10 days only , not more ) ….. which one is best ? 🙂 How can I answer this? Each one is different and varies across time frame. However I do have a greater conviction in simple moving averages. I use EMA crossovers for positional trading and most of the time I see that my profits are eroded by half upon exit. Though its a winning trade, but I see there is some scope for improvisation. Any way of getting either a stop loss or a trailing stop loss while trading with EMA Crossovers? Yup, you can always enter the trade based on EMA crossover and once the trade starts moving in your direction, start trailing it…your exit will be far better this way. Any particular way/method to trail the stop loss ? No particular way as such. The best way is to increase the trail by 0.5% for every 1% move in your direction. I’ve never tried 5×35, so I cannot comment…I’ve tried 9×21 and it seems ok.
9 minute EMA (or SMA) crossover with 21 minute EMA (or SMA). Dear Sir, How to set minute EMA or minute SMA in kite as there is only option of days in Period ? Sir, Supertrent indicater gives late buy and sell signal , as compare to MACD and ADX , do we need to change the Period or multiplier or Can we use defalut (7,3) combinations. Works extremely well when the markets are trending. If the markets are flat, irrespective of which momentum indicator you use, you will get wrong signals. Sir, Which is the best candle to refer Heikin-Ashi or Normal Candlesticks patterns. are you aware of problem with KITE? We can not modify the order. Not quanity. Not type. So I just cancel the order and place new one. But this is definitely a bug. Kite works like a charm, you can easily place and modify orders. Please have a word with our support team to figure out how. When a buy signal is generated by a supertrend indicator should we immediately go long at the market price or should we wait for the close of the candle (eg in a 5 min intraday chart) .Also how to determine the stoploss for a buy/sell signal generated by supertrend indicator. I’d personally prefer to wait for the close of the candle. As far as SL is concerned, I’d suggest you trail it as you would be locking in profits as and when the stock/index moves in your favor. Dear Kartik, thanks a lot for your precious efforts. I would just want to know which other indicators should I add with Supertrend so as to escape false signals (or at least minimize it) generated in the flat market. I find two indicators useful to identify trends – simple moving averages and ADX. Also, you can use support and resistance to know if the markets are flat or trending. 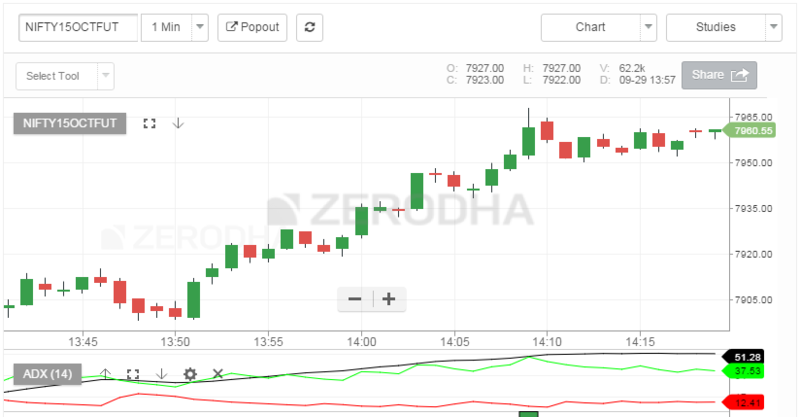 For example the markets between 3rd to 17th March was kind of sideways b/w 7400 to 7550…and you can identify this with simple S&R on daily charts. Is Pivots points mentioned in kite are same support and resistance. Pivot method is a way of identifying S&R, its not the same as like plotting it on graph. Both are good, really depends on the market situation. I personally prefer 5 mins candles, overlay it with 9 and 21 mins SMA. I have read so many books of famous writers on Stock market, but the way you had explained is marvelous. Thanks for sharing your knowledge. Could you pl. explain the breakout strategy and how to calculate entry and exit levels(targets) . Thanks for the kind words Alok. 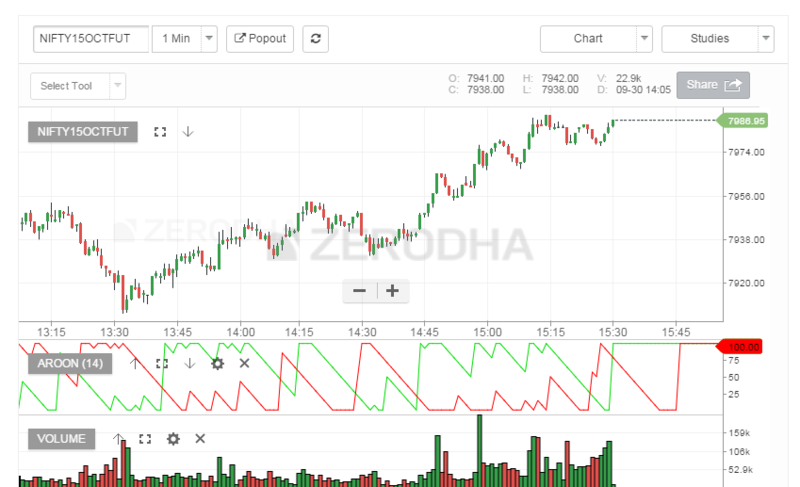 Check these chapters – http://zerodha.com/varsity/chapter/dow-theory-part-1/ and http://zerodha.com/varsity/chapter/dow-theory-part-2/ for breakouts. Sir which indicater can provide SL , Can i take pivot point support as SL . Great explanations.. Looking forward to the day when other indicators will be added – especially MACD and MACD Histo – and how that can be used with MA crossovers for a simple strategy…. I need to rework on MACD, will do it as soon as possible. i have a doubt over timeframe of 30 minutes chart. You are closing 9:15am tick at 9:30 not 9:45. but when i refer to same chart later, it shows 9:15, 9:45 correctly which is wrong. 9:15 tick must close on 9:45 not 9:30 otherwise whole chart goes wrong. You can nifty chart for example tomorrow to verify my point. Where are you seeing this Dileep? 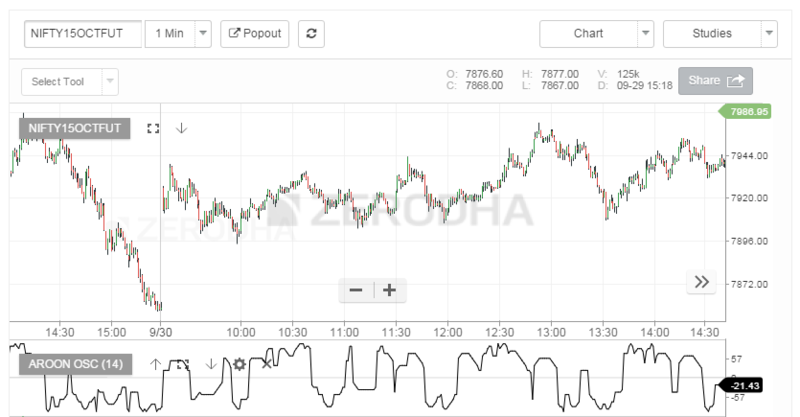 If you are with Zerodha then both Kite and Pi will reflect closing at 9:45 AM for the the 30 mins chart. please do not disclose personal details and trade details to 3rd party in any situation. is it possible to add sl and target 1 2 3 on supertrend chart when it generate new signal. that will help a lot. Not sure, as these indicators come as a standard package. I have also mentioned about personal details and trade details since it was compromised recently. Someone from Hyderabad “Sri Mahalakshmi Enterprises” and R.SATHYANARAYANA AND B.RAMANI IYER – these people have obtained my address and trade details from your call center or some sources. They have even mentioned I have traded in forex. How come these confidential gone out? You need to enhance IT security and compliances. Those are fraudsters and I am one of the victim. I recommend Zerodha should send a circular to all customers so that nobody else become victim. They are working for some broker in chennai. They will try to harm other brokers and businesses. Dileep, we are curious to know more about this, can you please mail me your phone number? my email id is karthik.r at zerodha dot com. Thanks. Could you pls explain how to pre determine whether it is continuation pattern or reversal pattern, as sometimes its just small pullback. It would be hard to do this, the only way to figure this out is by experience. However, sometimes volumes give some information…for example a pullback if associated with low volumes can indicate a possible reversal. Not sure Alok, I’ve not observed this. And finally had to give up. I’m in software industry right now with 8.5 years of experience but really want to get into trading, now sensibly and slowly. Could you please guide me how can I approach towards analysing the market. I’m starting the Varsity again but that’s just technical analysis, I also want to learn analysing the market based on the news we get from the markets. How can I do that. Also, with your experience, do you have any honest suggestion for me? I want to honestly start again. Looking forward for your reply. Please take my advice – concentrate on your software profession as you have valuable experience of nearly 9 years. Dont get into active trading. Start investing small amounts for long term duration, once you are comfortable with this move towards making overnight short term bets. My guess is it will take you few years to get to this stage. Regarding Investing, what do you suggest should be my starting point. Analyse the business, analyse the financial statements, develop an investment conviction …and the finally go ahead and invest. Invest with a long term perspective and nothing short term. Oh oh, thanks for pointing. Will look into this right away. Candlestick pattern do we need to check 1 day candle or can we check 5 minutes candle and take a decision on that, for intraday trading. which is the best time frame candle for doing intraday trading. If you are trading intraday then I’d suggest you use 5 or 10 mins candle. However I do know intraday traders who trade based on EOD candle. I guess this depends on your trading style. You can use supertrend, MACD, EMA, Bollinger Bands etc. karthik wen can we expect module 8 ,9 &10 completely??? eagerly waiting for it!! We are working on 8th module and proceeding sequentially. So I guess it may take sometime. one question that OI analysis and PCR for nifty not come under technical analysis? PCR is options related, hence I’ve included the topic under Option Strategies. Sir I m little familiar to the stock market…but new to the technical analysis..I m really happy and surprised that I m understanding this tough subject very easily…I like to play only option trading…can you explain which candlestick or other analysis pattern is suitable for me? Can we add an indicator on another indicator e.g. a Moving Average on RSI? Yes you can overlay indicators! The one which has higher liquidity reacts quicker! Can i Buy shares in NSE and same can be sell in BSE in Intraday? I called you are call center executive,he told me we can do it for intraday. When i inquire out side,my friends are saying it is not possible.. Please let me know which one is correct.If it can be done, How? You are executive advised me to add the same script in Market watch for both stock exchanges NSE and BSE..While buying, Buy it from NSE and While selling select it from BSE and sell the same quantity…and the price difference is our profit…Is that true? I apologies on the executive’s behalf. This is not possible on a intraday basis, however if you have shares in your DEMAT account, then you can choose to sell them in either NSE or BSE. Thank you..Can you tell me how can i take advantage of Future and Spot price of the arbitrage? I have one confusion that how volume is calculated, is it same as number of quantity because for example 1 qty of eicher motor is more than 200 qty of ashok leyland, money infused in market is more in eicher but qty is showing more for ashok, so how this volume is calculated. I buy 100 share of a company and someone sells those 100 share to me, then volume is 100. I’m aware of 100 qty buy and sell makes 100 vol. But my question is in comparison of 2 stocks, one which is having low price like ashokley but high qty , while another is having high price like eicher motor but low qty. So while calculating pre market volume what needs to be considered , which is having higher volume. You could convert both to Rupee value (value traded) to assess which is attracting more money. Value traded = Volume * price. First of all thank you , for your great insight and inputs. i wanted to test SUPERTREND indicator with 5 and 21 days moving average crossover any leads how to go ahead with it. Note sure as I;ve never tested Supertrend! I’d suggest you email my colleague – [email protected] for this. Thanks. I would like to know that ADX based trading what would be the SL can i give , Both buy & Sell ? 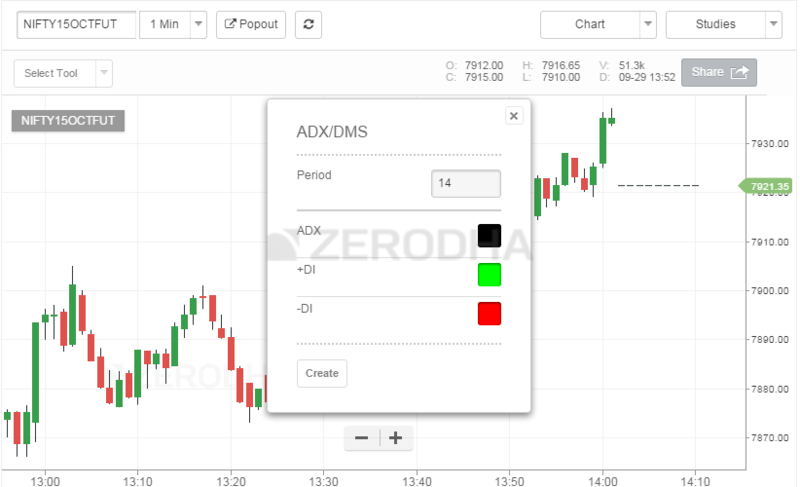 ADX indicates the strength of a trend, not a great tool to identify points to place your stops! Can every chart that we open give the ticking time of the market on top. selection of the scrip of 2nd/3rd list does open in case we want to view chart of other scrip for quick view in popped out charts, we have to go to original charts . can you incorporate these suggestions. Are you are talking about the charts in Kite? The timing of net and that of mkt is different by 1.5 to minutes. so every chart should idealy having timing in hr,min,sec. 1) any key to open market depth. 2) any function keys to place orders or buy or sell. 3) any function keys or shortcut key to view our mtm or position. 4) while changing the scrip name in d dropbox that appears, only the list no. 1 appears, and if v mention the scrip from list no. 2 or 3, it is not accepting or does not show in the dropdown window. It should ideally show if i hv the scrip in my match list from 1 to 5 anywhere. I hope you will into these points. Hi karthik. Please I have a requirement on Pivot points from your technical team. I want to refer the values of 3 days pivot points with a time frame of 1 Hour. But if I take 1 hour time frame on Kite I can see a unique pivot values for the past 4 days. Till 15 Min chart we can see the different values but not 30 minutes and 1 Hour. Please inform this to your technical team. i read about adx ,but i dont find it pi..is it not there in pi?? ?when can we expect it if it is not there? It should be there, I’d suggest you email my colleague – [email protected] for this. Karthik sir, thanks for your valuable advice on our various queries. Sir, though I will be the new to chart based investments.Sir, can I follow supertrend indicators for medium to long term investments in large as well as mid cap shares? Yes, you can. Give it a try and but your experience. 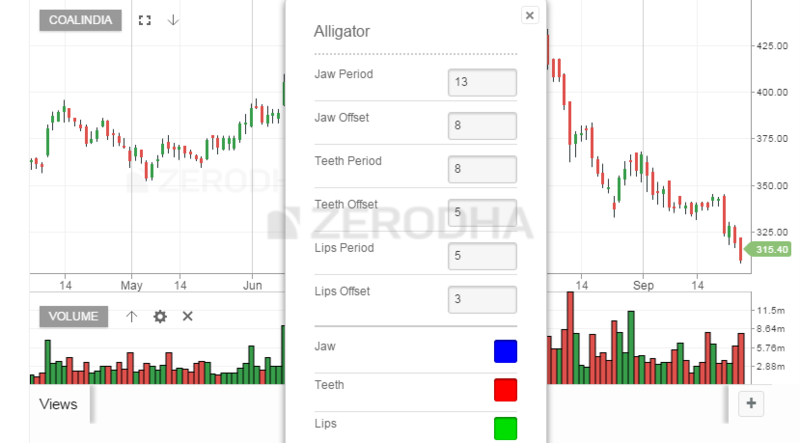 Your work is so great as you / zerodha team also cannot think what a best work you have done by providing good knowledge in simple way on technical analysis. It is very difficult to say greatness of your work in few words. It is useful for enlighten thousands who was in dark. भद्र पुरुष ही महान कार्य करते हैं । Thanks a lot. Sorry for taking your valuable time to ask – one should take average of 10 days volume for a share from BSE and NSE both or from a single exchange is sufficient. One exchange should be good. I personally prefer NSE. Volume candle combines the volume + price action in a single candle. Fatter the candle, the higher the volume for the day and vice versa. What is Volume Weighted Average Price , and what is the use of it ,Kinldy explain Sir ? Thanks for adding VWAP in the chart. Its such a powerful indicator for intraday trader. it is my humble request to please add preset order in kite in which script is pre selected including order type, Stoploss etc and only one click order get places. Thanks for the suggestion, will bounce this off with the tech team. I am a existing client of zerodha and my request is teach us ICHIMOKU indicator. Please send reply to my mail also. Sure, we will try and do that sometime soon. Thanks. what is the significance of time frame in the renko chart, lets say i plot a 5 point brick, for every 5 point movement it will form a brick irrespective of the time frame, so where’s the catch? Unfortunately I’m not too familiar with Renko…so cant really comment on this. how good is renko chart with the combination of super trend indicator for trading? Sorry, as I mentioned earlier, I’m not too familiar with Renko. It would be great if standard deviations bands could be added to the VWAP. You can try experimenting with Bollinger band overlays. No alert feature in Kite, yet. It makes sense to apply TA on the spot market chart. Thanks for detailed explanation of the super trend and other indicators. 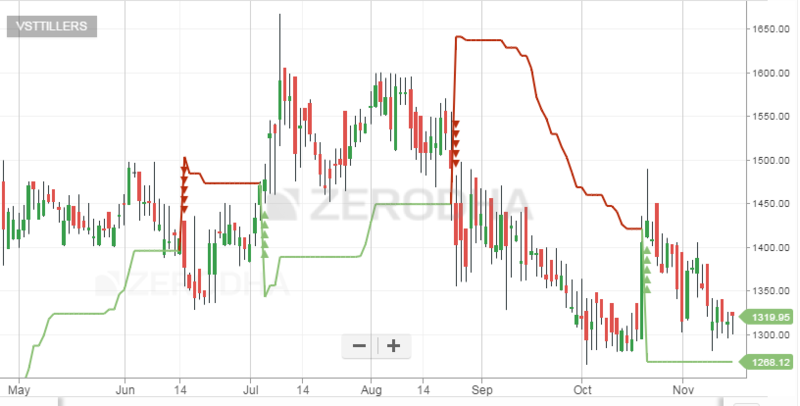 I am new to Zerodha as opened account recently. Today I noticed that Supertrend chart is showing different in Kite & Pi application. For example Nse equity stock- Auropharma the Supertrend Sell (Red) occurred at 11:45 hrs in Pi where as it is showing at 14:30 in Kite. While the settings for both are same at 14-3. Why kite is not showing same as Pi? This has misguided me as I am using Kite very easily compared to Pi which takes lot of time for refreshing. Please is it possible to make the settings in both application same or the user should have option to use whichever he likes. I would have uploaded the screen shot but I donot know how to do it here. I need to check this. Will get back to you shortly. which indicator should be used with STOCHASTIC OSCILLATOR to eliminate whipsaws ? You could try moving averages. karthik sir, i want to ask that according to you the combination of a lagging and leading indicator such as MACD and stochastic will help in taking decision or not? because i read in an article that it is very accurate in trending markets. Nothing is accurate Tarun. These tools are there just to help you support your decisions making process, over dependence on these can actually get counter productive. Dear Karthik, I am awaiting for ur reply on Supertrend indicator query which I posted on 10 jan 2017. Sorry, I must have missed this…and I’m unable to find the link. Can you please repost the same? I am reposting my query as u missed it. Today on 09-01-2017 I noticed that Supertrend chart is showing different in Kite & Pi application. While the settings for both are same at 14-3. Why kite is not showing same as Pi? This has misguided me as I am using Kite very easily compared to Pi which takes lot of time for refreshing. Please is it possible to make the settings in both application same or the user should have option to use whichever he likes. I’m sorry if I’ve missed your query earlier. When adding ON BALANCE VOLUME indicator on KITE ,It is not showing values of OBV indicator. Hi friends. What level to cross in ADX to consider trending market and level to drop below to find non trending market? Because different people will tell different levels like 22, 25, 30, 40. Getting confused. Thanks. Just an opinion – each person has his or her own preference, its best you set up trades and optimize them to what suits you. You see there are two major or main stock exchanges in INDIA as BSE & NSE,and the whole wonderful world trades in that.Means-people from different places and with different point of views does exchange their money and therefore the price gets updated every second,then how come NSE & BSE gives same outcome of price of every single stock everyday?! That because the asset is the same. Think about it – the price of Onions in shop 1 will be same as in shop 2 right? Likewise, price of Infy will be similar in NSE and BSE. Yeah,that makes sense! Thanks for all. ??? Karthik Sir, awesome work on all these modules. I am a new user of Pi and have 2 basic questions. 1) can we import the scrips added in marketwatch from kite to pi? 2) is there a way to apply the study done on one scrip to all my scrips in marketwatch. 1) No, they both are two different eco systems. 2) Save as template should work. although I need to double confirm this. Meanwhile, please feel free to touch base with our support to clarify this. sir, in Pi platform, price does not change in order window according to the market price as in kite. pls rectify it . Will pass the feedback, thanks. As I see, the Pitchfork tool is not available on Pi . Any plans to introduce it it ? Also, can I draw pitchforks on different time frame charts of say, 50 scrips and SAVE all of them in Kite ?Will they load the same when I re-login ? Thanks..
Not sure, will check with my team and get back on this. Thanks. A person X is full time scalp trader. A person X bets its 20,000 on, say, JSWSTEEL at 10:10AM @185.50. At 10:25AM, X books profit @186.10, making about 62/- (~0.3%). Similarly, it trades again to make profit of, say, 70/- (~0.3%) at 10:50AM-11:05AM. Trading 3-6 times a day, X makes about 1% return. At the end of the month, X makes about 10-12% returns with scalping as X trades only 12-15 days a month. A person X utilizes margins given by brokers for intraday trades up to 10 times. In this way, X is able to make about 10% returns a day (not 1%) as its 20,000/- can now buy stocks worth 2,00,000/-. At the end of the month, X is able to make about 90-100% returns (as compared to its 20,000/- amount) as X trades only 10-12 days a month with more care. Question 2 – If yes, what person X need to do to be such a successful trader as it is in above situations? Or, is it too difficult for a full time trader to be like X. Question 3 – How above situation/s, or person X, can be modified/improved to make it a common practice? Question 3 – What is your advice to me if I really aspire to be like person X? I want to start with 1 trade a day that too by considering it like a swing way. Lots of thanks in advance!! James, both the situations are possible…but let me tell you it’s not easy, especially situation 2! The trick is to achieve consistency in your trades. Even the top hedge funds in the world fail to achieve this consistency. They say in trading, 20% is strategy and 80% is risk management. So there is lot more going on than just margins and strategy. Keep at it and I hope you find success. God luck. Thanks for your kind attention !!! My presumption was same. I’ll wait for the risk management module of varsity & will practice on that to perfect myself. I would be glad to know the answer to question 5 as well. Also, Is Varsity content (along with practice) enough to achieve that consistency? As far I know, the contents here should give you a good start…but please do read up and start exploring newer dimensions of trading and investing. In addition to question 5, please tell, as per your experience, how much return is possible (common in real world) in Situation 2? Right now, I am preparing myself to achieve 40-50% returns every month in Situation 2. Is it ok? Isn’t my expectation more unreal (I guess not, your experience/advice =?)? Thanxx for all 3 answers in advance !!! Q5 – Module on TA and Futures should be good for scalping. Cannot comment on returns, James. But sorry to sound discouraging, please do not be under the illusion that you will be able to generate a return like 50% every month…and please do not quite your job to do this full time. I myself don’t know anyone who is able to smash such numbers month after month. Thanks for honest answers of my queries !! Not quitting job so soon (obviously) not at least until I start achieving consistent desired returns. Thanks a lot for such a good quality educational content !!! Good luck and hope you stay profitable. How should i combine different indicators with candlesticks and chart patterns? is there is particular thing that needs to be kept in mind before combining indicators/candles/chart patters in order to optimize the desired outcome? Give chart patterns higher priority, the trade idea should originate from candlestick patterns. Look at indicators just as a reconfirmation to the trade setup. I personally do not prefer relying too much on indicators. I am checking pi software but I see chart and Chart tool option in menu is disabled for me. How to enable that ? Suggest you get in touch Zerodha support for this. For smaller/intraday trend identification, ADX is working fine in 5 & 15 mins timeframe.But Adx is not working/not increasing in higher time frames like 30mins, 1 hour and 1 day. Pls suggest ur view. I used to follow only SMA 21x50x100x200 for trend identification and it’s working fine in higher time frames.in addition to this kindly suggest for better evaluation. Remember, a certain indicator with a certain parameter may work for a certain stock. The same may not apply for another stock. The trick is to calibrate and fine tune (to figure out what works and what does not work) it across your watch list. First of all, I would like to say I learned a lot with your blogs. thanks for sharing valuable information. my question is that Which one is you would suggest using as I am new to this cover order or bracket order? I am starting with an initial capital of 5K rupees. and also can we modify stop loss on both? If you are starting with 5K, I’d suggest you execute few simple EQ trades before getting into BO and CO. Remember, there is is the EQ segment and the derivative segment. Any trade in the spot market or equity market is referred to as EQ trade. When you trade in EQ you can either do an intraday trade or you can take delivery of the stock and hold it overnight. Hello, if I enter a trade as per Supertrend buy/sell call its almost sure that if I wait till the line colour to change it’ll lead to a loss or no profit. So, how am I supposed to set a decent target once trade is initiated? Also, what could be taken as a better stoploss instead of supertrend line? Because if a closer target is set then the supertrend line stoploss wud b pretty far making RRR bad..
You need to start calibrating your trades to identify which parameters suits which stock. It is hard to use the same set of parameters across all the stocks. So start tweaking the numbers and see which supertrend parameter works for which stock. 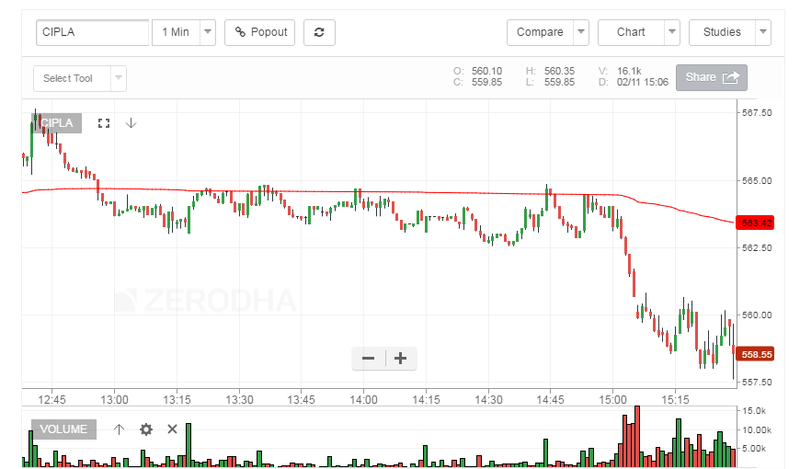 Ty fr the info, I checked several 5min intraday charts and EOD charts and found that long call from supertrend indicator are almost giving 80-90% or even more correct signals and hence giving a profit. So, is it worth trading as per the indicator only? No indicator alone cannot lead you to take a trading decision. I know we cannot trade solely based on an indicator but what could be the reason of high profit chance if someone would’ve went according to Supertrend calls? You have to calibrate these variables for each stock Aloo. 1.) Which Indicator in your opinion is the best Momentum indicator on a 5 min chart for day trading which I can confirm on a 15 min time frame also ?Kindly also mention any tweaked parameters if they work better than default values on 5 min chart. 2) The technical analysis is based on a premise that a human being with his knowledge, emotions,fear and greed will repeat the actions which his predecessors have been doing in the past and it reflects in the Chart patterns and various Technial analyses that have been employed in the market. Now with more and more Computers and Robots taking upon the trading each day, the human element will be eliminated.Does that mean that the analyses and trading methodologies which are being employed today will become redundant /obsolete in the near future ? If so , how can a mortal human being who doesn’t have access to Trading Robots/ Algorithms keep abreast with them ? 2) I’d agree. Eventually we all have to find our edge and stick to it. However, the silver-lining is that most of the good algos operate in the micro-milli time frame. So in a sense larger time frame trader without the knowledge of coding still have some space to breath. Just two more things I forgot to ask was that (1) On the stochastic indicator on Kite, only the time period can be changed , colours of fast and slow can be changed and overbought + oversold values along with colours can be changed.I wanted to ask that what are the default settings of %K and %D on this indicator? Also, what is the default smoothing value? a) RSI(14) = RSI of 14 days on a daily chart = RSI of the last 14 Hourly candles on a hourly chart = RSI of the last 14 Five-minute-bars on a 5 minute chart and like wise…. You are right on the RSI part. Default values for %K and %D and smoothing is 14, 9 and, 3. Will certainly do this. Thanks. How can we choose best indicator for us? Why so many indicators? Can’t we rely on 2 or 3 indicators? All the indicators give signal to buy & sell, so whats the main difference between them except there unique method of giving signal?? It is very common for the indicators to give opposing views. Its best to keep it simple. Yes, it would. Keep it simple. It really depends on your trading temperament. I like to keep my charts clutter free…this helps me focus on price action as opposed to what indicators are suggesting. I just overlay moving averages (1 or 2) on the charts. VWAP: In the section – How to use the VWAP? Point# 5 says IF CMP > than VWAP then the trend is on the positive side/higher. Contrary to this point# 8 suggests going long if the CMP VWAP. Point# 5 says IF CMP is higher than VWAP then the trend is on the positive side/higher. Contrary to this point# 8 suggests going long if the CMP less than VWAP. As per my understanding, one should go long when CMP higher than VWAP. Point 5 implies that trend is higher, maybe you could expect mean reversion? Not sure if point 8 is suggesting that. how to do BTST/STBT, i m a beginner. please suggest the time frame of trading as i had already learned that intraday is surely not the thing to do right now. If you are stating now, I’d suggest you look at doing equity investing – i.e holding positions overnight. Once you are comfortable doing this, then maybe you can try short term swing trading before BTST trades. Will put this up as a supplementary note soon. Do we have any co relation tools between sectors or stocks?? Default supertrend parameters is Period;7,Multiplier:3 .will it work for all time frames(1day,1month and 1 week)? For intraday 5 mins ,10mins and 15 mins chart ,if we want to use super trend what are the preferable parameters ? You need to back test this on stocks. It may work for stock 1 but may not work on stock 2. There is no ‘one shoe fits all’ kind of thing in markets. Hi I am using Kite and I want some guidance on Supertrend parameters? I want to know if I am looking at 15 min candle of a stock and if I put 15 in the supertrend period parameter as well then what it means? Does it mean that supertrend line is plotted based on close price of last 15 candles of 15 min each? or Last 15 candles of 1 min each? Another question about time intervals: I have seen on Kite that the first 15 min candle time shows as 9:15 am, however, some other softwares show as 9:30. However the number of candles are 25 in kite and other software. So for intraday purposes, if I have to see the first 15 min candle then, should it be from 9 to 9: 15 or 9:15 to 9:30? Although the candle starts ticking at 9:15, the completion of the formation of the candle is at 9:30, which is 15 mins past the open. It means it is looking at 15 mins candle of last how many ever data period you are looking at. After going through TA module,I have started tracking mini crude oil may futures chart since last week. I see that sell signal is visible in 5 min chart while this is not visible in 15 min chart. Why so? Though both the charts are showing that the trend is on lowerside. Indeed oil prices have been pounded badly since last week. 2. What time frame chart is suitable for trading in crude futures? This is because you are looking at two different timeframes. I;d be comfortable looking at 10mins chart or any timeframe higher than that. What shd one do if there is a buy signal in 5 min chart and sell signal in 30 min chart ? You need to stick to a time frame and take action according to that time frame. Do not cross reference the buy/sell signals across time frames. Just wanted your help as I didnt know who to approach . I use metastock s/w for analysing the charts. I want to know how to use scanners…I mean suppose if 50 MA cossed 200 MA in any stocks or if the prices are above 50 day MA and 200 MA it gets highlighted easily . I tried asking the vendor but I am afraid it has not helped. Also tried googling . Would appreciate if you could point at the right direction. 2. Also do you have any screening system in kite? 1) I used to use Metastock around 8 years ago, and I seem to have forgotten the layout and technicalities. So I’m afraid, I wont be of much help here. i joined in zerodha on sep 2016. As of now I am doing only on equity cash segment and also i got winners certificate too in 60 days challenge. Can i get fundamental and technical analysis training to improve my trading and investing skills. We have put out a really good content on both TA and FA, I’d suggest you read through these modules. Tnks and am looking live training sessions for better understanding. Since lot of queries come while reading self material. Please do post them here, I will reply back within 24hrs or sooner. 2. Is it possible, in Zerodha firm, that I log-in from a single “sub-broker” id and trade for them-on their behalf? 3. Logging-in from each individual id is quite time consuming and by the time I will do it the ground situations changes a lot. 4. I had also spoken to one of your representatives regarding this, but they said its not available. 5. Can this be made possible? 7. Am sure, if you get a solution to this, lot of people who cannot trade would able to do so. Thanks for the kind words Vinod. I understand your concern, but our risk managment policies will not permit what you are asking for. Besides, this is also not permitted by SEBI. However I will open an account with Zerodha and will get all my 10-15 friends registered with you at the earliest. I guess if that comes under permissible rules, it can be extended in your brokerage aswell, and my problem would be solved partially. Great, I’m sure all your friends will have a good experience with Zerodha. Good luck. I have a query regarding a trading strategy that I use for day trading. What I do is, use the VWAP indicator on 5 minute charts. Then I wait for the stocks’ price to fall to the lowest that it has been in the last two days, or allow it to rise to the highest that it has been in the last two days. I then take a long or a short position accordingly. I have been using this method for a few days now and have booked considerable profits except for when the price begins to consolidate. I wanted to know if you see any drawbacks in this strategy. Also, I should say what an awesome job you have been doing with these modules. It has helped me a lot. Sure. It sounds good here, but frankly you will have to backtest your strategy to make sure its working under all possible use cases. But in double bottom it is an opportunity to buy …. I guess the only ways to learn how to avoid is to learn by trading. Eventually, experience will teach you which pattern to trade and which ones to avoid. Is there any way to find morning star candle stick pattern from numbers of stocks rather then checking chart of all the stocks. Can we do codify in the Kite tool to detect the patterns in the chart? As per your experience, Which chart patterns are more reliable to enter a trade? is there any way to find resistance levels at all time highs? as it is not possible to predict resistance levels than how can the analysts find resistance levels in all time highs. I am talking about day trading in nifty futures only. Well we learnt a lot in this module. Now it is easy to analyse the pattern, trends etc in middle of the chart but its very difficult to take a stand near right edge of the chart where future is uncertain. As far as candle stick pattern and volume are concerned they are reliable but indicators are not so much useful. By the time they show a reversal or a new trend a large chunk of points has already gone. I hope you got my point. Please advise me how to use these indicators or to do day trading for that matter. Weel, this is in fact the whole point of TA. You need to get to a position where you will be able to take a position looking at the right side of the chart. This takes time and patience and will have happen over many trading hours and studying charts. Good luck. Suppose ATR for X stock is 40 and multiplier is 3.Then 40 X 3 =120 what does this value indicate(ATR x MULTIPLIER).I STILL DONT UNDERSTAND WHAT VALUES TO BE PUT ON FOR PERIOD AND MULTIPLIER FOR INTRADAY TRADING AND FOR LONG TERM TRADING? WILL BE GRATEFUL TO U IF U PROVIDE MORE FOCUSS AND GUIDANCE ON IT? Hi Som, I’d suggest you stick to default values to begin with till you get comfortable with the indicator. if ATR get multiplied by multiplier then how can it help me to either sell or buy the stock. thank u karthik for reply. If there are other values to suggest please suggest as per ur experience with supertrend indiactor? Well, there is nothing like one shoe fits all here. For each stock a different parameter could work. ATR that we get from Kite is different than that of Pi. I downloaded OHLC data from Pi and used it to calculate ATR for different periods of my choice. The ATRs were calculated using the simple average of the true ranges of previous periods, which was matching with data from Pi, but not with Kite. Can someone please clarify how ATR is calculated on Kite? Mainly, what are the weights assigned to true range from previous periods? Hmm, possible due to two different charting libraries and two different (not drastically though) formulas used. How can we apply ichimoku charts on Pi? We do not have ichimoku on Pi yet. Cant really commit a timeline here, Amit. We use vendor’s charting engine, so the update has to happen on their end. 3. Whether weighted close is same as Weighted Average Price? Both HAC and EMA are available on Kite. Please look at the chart types and studies for more information. Hi karthik sir,is it possible to earn RS 1000 per day from stock market consistently with a capital of RS 50000 by selecting a good trade a day?just one trade a day and no over trading. Is it easy and possible please suggest me? We are talking about 2% daily return or about 504% return for a year. A very very very tough task if you were to ask me. Sir, do you think stochastic is a good tool to practice charting? If yes could you please explain it along with the other indicators? I tend to depend more on candlestick patterns rather than indicators…so generally speaking, I look at very few indicators. Most of the times, I restrict to just the moving averages. every educational tool provided here is awesome, and i’m looking for contents about zigzag. can’t find it. is it available? Thanks for the kind words Selva. Yes, the ZZ is not available. Maybe I will add it one of these days. Say I go long when the +DI crosses the -DI, after few candles the -DI crosses over the +DI then as per rule the sell signal is generated then How can the the first trade (based on the buy signal) be valid ? ADX just confirms the trend, it’s best used in conjunction with a trading system where the signal to buy and sell originates. Depending purely on ADX is not a great idea. 1.) Say, I have identified a stock and S&R levels and other related research, finally I am bullish on the same, and as per our general convention the first resistance point should be our target, now, what I want to know is that Is there any way to determine or predict the period it will take to hit the target?? 2.) The market depth generally shows top 5 ask and bid price, if the total number of qty for sell is say 3000(top five), now if I place a market order for 5000 share to buy then the remaining 2000 shares will be fullfilled from upper side or lower side . How the large qty market orders affect the price? Secondly, which one we should prefer market order or limit order? 3. )I am little bit confused about pre and post market orders , the kheechdi that cooks up during 9 to 9:15 , and , moreover who can and should place pre and post market orders and their merits and demerits. 1.-Is not the points 4 ,8 and 5,7 are contradictory to each other. I mean in point 4 you say the if the price is below vwap then the stock is in downtrend , but in point 8 you say if you want to go long the stock it is efficient to long at a price lower than vwap, मतलब कोई स्टॉक downtrend में हैं तो भला उसको buy क्यों करेंगा ?? SAME DOUBTS FOR OTHER TWO POINTS, IT WILL HELPFUL IF YOU COULD ELABORATE EACH POINT WITH THE HELP OF CHARTS. The assumption is that you are trading based on another system and you are looking at VWAP only for the sake of efficiency of the fill. Sir, I am an orthopaedic surgeon with keen interest in stocks..
Q no. 1:- Please guide me how to follow the trend using ADX indicator, Should I keep the trade on till the ADX is rising and exit as soon as it reverses? Q no 2 :- If the candlestick has already crossed the SMA but still my supertrend is in sell region, should I initiate a long position of should wait till supertrend indicator says buy? Q no. 3 :- May also use the slope of supertrend itself to follow the trend, as I have seen that steeper the slope better moving is the trend, and whenever it goes flat, a moment of indecisiveness comes in; should I stick with this methodology or please give your kind suggestions..
3) Slope again points to the momentum. You may as well look at MAs. Its like if I start trade by using MACD and supertrend, and then remain in trade using ADX? as it keeps on growing I shall keep my long/short positions intact and whnever it goes down I will quit as it will show the losing trend? isnt it ? how would you start and exit a trade? pls explain..
I’ve explained this for each and every candlestick pattern. Request you to kindly give it a read. Absolutely. However, you may want to use candlesticks as your main decision-making engine. Thanks for the kind words, Doc! I can see there is some technical error in dis module as the comments page is same irrespective of different chapters i.e support & resistance chapter, volume chapter comments page are all same….. I think its sorted, can you also kindly confirm? Thanks. We are working on it, Arun. Sir What intraday chart time frame do you mostly prefer for mcx nickel copper etc.etc.and today I saw alligator is it good can trade to depend on it..
15 mins chart gives me the comfort! And today I saw doji appear in uptrend but still market is moving high why? actually what doji does and how can I predict what next candlestick should be bullish or bearish..
Well, patterns are only predictive in nature, they do not guarantee movement in any particular direction. You can plot the volume indicator below the price chart. Sir please tell me some about your trading strategies, time frame, indicators and entry and exit, risk to reward ratio.. Please sir. Ok Sir thank you.? but sir my last question is what moving average setting do you mostly prefer in 15 minutes chart.. Exponential, double exponential or triple exponential.. What is the most accurate one..
I’d prefer the EMA over simple MA. First of all, Thanks a lot for all your efforts you have put in for Varsity. This is very helpful. I am not able to clearly decide on Support and Resistance level, Can you let me know any more parameters which I consider to get more affirmation on S/R levels. Thanks once again for all the efforts. Yesterday’s AMBUJACEM chart showed a bullish engulfing pattern. I entered CNC trade at 266.5 with a stop loss of 258 as suggested by ‘the lower of the two rule’. Today the stock closed at 272.10 and I am planning for a BTST trade. My SL-M order cancelled automatically at 4pm by Kite. So probably I will need to place a new AMO SL-M for tomorrow . My question is that for the new SL-M order should I stay with the 266.5 suggested by earlier rule or should I increase it to the low of today’s green candle (264)? You can certainly alter the SL to suit your convenience. But do make sure there is a logic behind what you do. It is very difficult to differentiate between paper umbrella and spinning top. Can you please help me to find out the best way to differentiate between both ? Spinning top has a wafer thin body and short shadows, paper umbrella, on the other hand, has a small body, short upper shadow, and a long lower shadow. 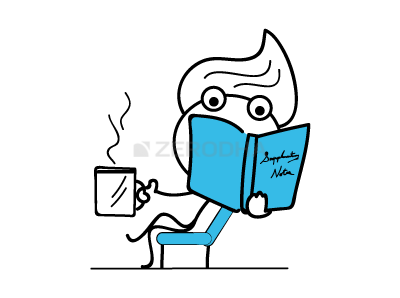 Lot of things to study, it is very useful to beginners like me, Today i learn lot of thinks, thanks Zerodha team to develop such a study material. Happy to note that, Rajesh! Karthik, just a QN pop up in my mind…..can I buy shares in delivery (CNC) by not entering the quantity of shares I want to buy but the amount of money I want to invest in a company??? ADX indicator is missing in PI in the study option. Could you please check and confirm. Look for the directional movement system. It is the same thing. Now I see Alligator Indicator is missing in PI however it is available in Kite. Also, any plan to include Relative strength Comparison(RSC) indicator. I think it is available only in Metastock. We use 3rd party charting engines so it really depends on them to add indicators. is ADX indicator available in pi? Yes, its called Directional Movement Index in Pi. Thanks for the wonderful material! Is candlestick pattern analysis is good for someone looking to hold the position for 1month to 3 months? which is an ideal time frame to be selected? If not which technique to be used for analysis. I’d suggest it’s best suited for trades under 4-6 weeks. Although, I’ve noticed the beginning of a long and sustained momentum runs based single candlesticks patterns. If I want to start trading with time duration of 1 to 3 months what analysis should I go for? I’d suggest you start with Technical Analysis. Sir when will we have Stochastic RSI indicator as its on inveterate.com on kite? We depend on a 3rd party vendor for charts. Let me check with the team on what best we can do. I am interested more in commodity so, Can I start commodity module after this or I have to follow the sequence of module . I’d suggest you go through the Futures module before getting into commodities markets. Which one is the best between RSI, William%R and Stochastic indicator to identify overbought and oversold zones? Nothing like the best…each indicator works under different market conditions. Is there any TDI (Traders Dynamic Indicator) in Kite. Don’t think so, but I’d suggest you run through the studies once and double check. VWAP is available on Pi. No, Sudheer, unfortunately, this is not available on Pi. However, Kite has this indicator. Check out Japanese Candlestick Technique by Steve Nison. Not found where? It’s there in both Kite and Pi. 1. What should be the time spacing (5m, 15m or 30m, 1D etc.) when using different indicators mentioned here? 2. What should be the period(1D, 5D, 1M etc) since for example some indicators are for 14 days, then if we select 1 year period for the stock price, is it okay? How does it work? The indicator will still show for 14 day period only? Or should we change this 14 days to 365 days? 3. Should all these like the super trend be used along with the other 6 point check list like candlestick pattern volume etc or on its own? please tell me if i should invest in stocks which are at 52 weeks high if they are just increasing after long time(1-2 month) and volume is satisfactory.? how should i interpret it? as an uptrend or just a noise in market? It really depends on your conviction, Suresh. I have noticed that the VWAP value which I calculate manually does not match with the one collecting from Nest Trader. For example please find the INFY SEP FUT data which I have collected from nest trader on Sept 9th, 15min interval. the first column is the Vwap value from ZT and the last column is the wvap value calculated manually using above method. Can you please let me know why there is a difference? You will have to discount for minor errors, Anoop. This is because one cannot capture all the tick data. Supertrend indicator cannot be used in expert advisor in Pi trading system. That’s why i moved to amibroker. There are meny AFL regarding supertrend . I also coded mine . But there is some differences in signals. We know that olivier seban developed supertrend, but u try it on ami there are no one to authorise or to verify. So it will be so helpful if u guys provide original engineered Supertrend in AFL for ami. It will be okey if its in TradeScript but i assume it will be very hard. Thank u. This could be tricky, Dipayan. I’ll pass on the feedback though. Thanks for reply. That would be very helpful. I’ll be waiting. How to assure that a positive supertrend crossover is true or false. What other indicators can increase the degree of surety. Hmm, you can cross check this with candlestick pattern perhaps. Can I use the same check list for trading nifty futures.Is is it good sir? Trading for a 10 point move can be very tricky 🙂 What will be your risk to reward ratio? 1.As it is intra day,risk reward ratio between 0.5 to 1 is ok for me.But please give your opinion regarding this sir. 2) I would suggest you tweak the checklist given chapter 19 slightly for intrday. For example, you could consider overlaying 9×21 minute as your intrday MAs. You have replied to one Sunil,, that FIBONACCI, is available on kite. I shall be grateful, for your answer ,which would enable me to really have FIBONACCI chart. (instead of the same cliche answer). Hhaha, thanks for the kind words, Chandra! I hope you will continue to like Varsity! Iam new to zerodha.Yeterday I start my first trade in zerodha.Iam a scalper and did minute to minute trades with nifty and bank nifty.My profit was 2298.I felt very happy.But today i got mail from zerodha.Taxes were very high and actually iam in a loss of 928..:(.Pls help me sir. Well, taxes are a reality and no one can avoid it. Maybe you are over trading. Take fewer trades with high conviction. Focus on profitability and not really on ‘number of trades’. I actually encountered this website when i was searching some topics related to Options. I was so impressed by the lucid explanation that i devoted time to read other chapters as well. Took my learning a notch higher when i decided to open a trading account with Zerodha, hoping to apply the same. Finally i have some good material that i could relate to. To cut a long story short, great work team! Cheers! Thanks for the kind words, Soby! Hope you continue to enjoy learning here. I have been tracking markets for last 10 years, i opened and closed lot of demat account with several brokers but “Zerodha” is different amongst all of them. Thank you for your kind support and guidance. I also want to ask that if I want to go ahead and learn technical analysis in depth please recommend a good institute or professional who can teach. Sorry, I mean Karthik in Gujarati we spell Kartik. Ok, thank a lot …?? Sir,Iam following a trading strategy and it is working quite well.But,main problem is that Iam unable to ride on winners for long time.Example,if a trend is working in my favor,then Iam getting out of positions with less profit because of the fear of ‘trend reversal’.But actually the trend is continuing.I loose tons due to this sir.Even trailing stop loss is not working,because my stop loss hits and trend continues…”Cut your looses and let your profit run!! !”…Iam doing the first one correctly,but unable to let my profits run.Please suggest me a a way to solve my problem.Which indicators or others I have to use??? 1) Have deeper stop losses – which also means you should be willing to take higher risks. 2) Have a mental stop loss – dont place them on the system, but have it in your mind and get out when you know its not working in your favor. I’d prefer the 1st one. Sir, if i want to enhance technical analysis knowledge then can you refer any course for same? And whether supertrend indicator can be get applied to mid term holding to long term holding ? Yes, you can use ST for medium-term trading. i am confused in between CMT or CFTe. I’d say CMT. But please do your research as well. Sure sir, and also suggest me some books on technical analysis and future-options. i have japanese candlestick charting by steve nison, but want to read more n more. Really inspired beacause of your knowledge. Hey I just completed the Technical Analysis module. Just want a suggestion. Should I start using this knowledge and start short term trading or should I complete all the modules and then start my quest. I’d suggest you start with identifying short-term opportunities using TA. This will help you as and when you learn other topics. 1. Could you suggest any indicator which would help in determining whether the trend is moving sideways? Other than ADX that is. 2. Could you explain briefly about the Elder Ray Index as it is plotted on Kite? I have an idea from whatever I read on other sites but there the bull and bear powers were plotted separately and its kinda difficult to understand while looking at the way its plotted on Kite. I know writing an article on it would be tough but even if you could tell the basic interpretation (in accordance with how it’s plotted on kite), it would do. Thanks in advance. 2) Will try and put up a note on this sometime soon. Just one more thing…supposing I open positions in FnO segment and I intend to hold it for a couple of days. Right now, since we don’t have a GTC or similar order I have to login everyday and place a fresh stop-loss order when the market opens. What if I place the stop-loss order for the open position(s) as an AMO order after 4pm current day and before 9am the next day? Will it be considered as a fresh order and be executed or the exchange would understand that it is actually a stop-loss order for the open position that I am holding. The reason I am asking is because it’s easier to place the stop-loss order in d evening or night rather than every morning when you are in a rush for other works. Please let me know. Thanks. I’d suggest you start with RSI. I want to take VWAP in seperate window like rsi or macd or willams%r. I want to seperate it from candles. Is there any idea to do this? If not will you please consider it as customer requirement. How many days will it take to do this. Are you updating customers requirement in software? We are always eager to hear our customer’s feedback/requirement. VWAP is certainly high on priority. Unfortunately, I cannot comment on timelines involved. Please add open interest & vwap value (which is available with you) in DEPTH view. These are essential for customers. I understand, will pass the feedback to the development team. Thanks. Thanks for your content regarding trading. It is helping alot of beginners like me in understanding stock market in a better way than ever before. I really appreciate you and your team at zerodha for making it possible for everyone. 1. I have completed technical analysis module and i decided to put all the knowledge on the real time stocks. 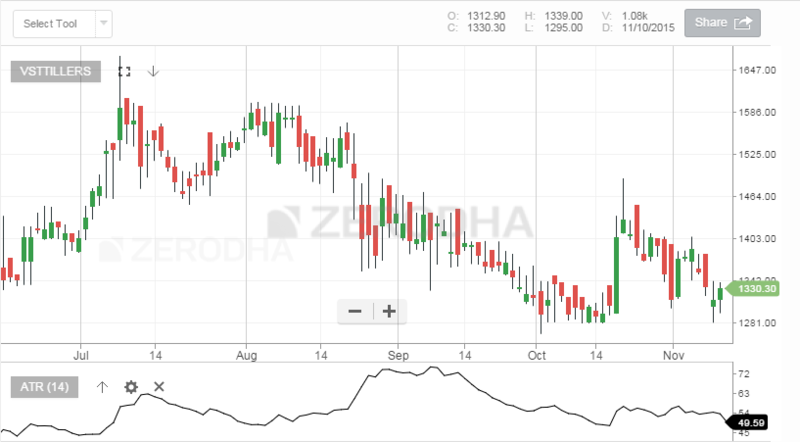 But, when i started analysing the chart, i was unable to replicate what has learnt in the module and couldn’t able to identify patterns and predict what is going to happen. Guide me how to put everything that i learnt in the practise or provide any other additional study material which gives practical implementation guide. 2. Even though you suggested newbies to not to try intraday but my mind is putting a lot of pressure on my thought process to move against the waves and learn the stuff from the risk. Now comes this tricky part. I want to learn yet not to fail disastrously(little failing and learning is okay though but not too much). Tell me how to have a plan for this. 3. Initially i’m planning to invest 5000 as a part of learning process and expecting 100 INR as an overall profit for a day. Kindly tell me how i can achieve this target with an intraday strategy. a. Tell me how to choose different stocks for the portfolio or regular intraday stocks and how to bet money based on trends. b. 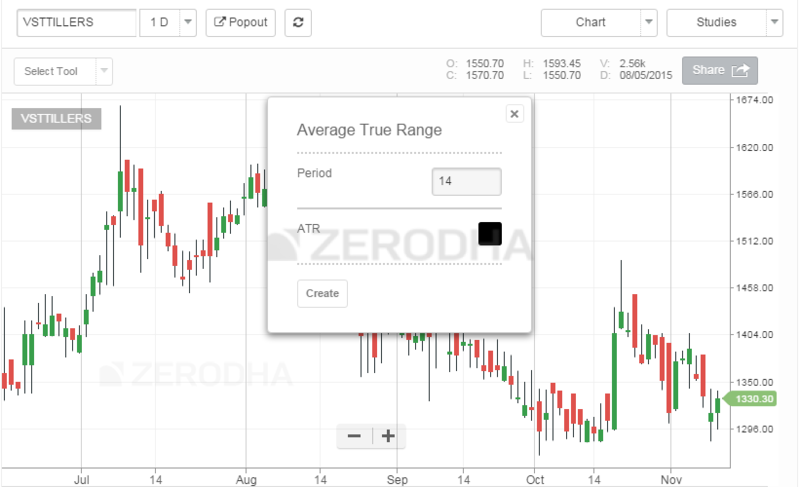 Help in finding patterns easily with the help of predicting indicators. c. What are the basic parameters, indicators, patterns, trends, identifications that i should know everyday (not taking much time) to get min of profits? d. Im always getting confused with stoploss, stoploss-m and other advanced options while placing an order either buy or sell. 2) I dont know how this can be done safely :). The harder you fall, the stronger you raise, provided you willing to learn from mistakes. I’d suggest you reread the chapters on candlestick patterns. Sir, Thanks for promt reply. As I observed that some times VWAP value shows 2 digit & some time 4 digit in charts. (56.15) & (56.1348) Why it is like this? Ah, need to check this. But for all practical purpose, you don’t have to go to 4th decimal, unless you are trading currencies. It is very very important in commodity for me. As this is available with you, need to only show seperately & also in DEPTH area. Sure, have passed the feedback to the tech team. Thanks. Can you please suggest the books for technical analysis? and the all indicators analysis and how can we use it for our trading purpose? what are the possible combination that we can fit in the scanner for some trading systems? Aslam, I’m assuming you have read through all the content in the TA mule here. In case you are looking for more, I’d suggest you pick up this book called ‘The Japanese Candlestick Charting Techniques’, by Steve Nison. I think I attached wrong aadhar no to my account. This happned as I am handling many accounts. So I want to confirm aadhar no. This is also not visible at q zerodha. Is it possible to delete current attached aadhar no? If so I will again update correct no. I try to call support but no response. How to solve this issue? please do the needful. why it is not visible in q zerodha account. Ulhas, you can call or write to our Support team and they will respond back to you with the information. What are your views on HDIL… Breakout from triple bottom on huge volume today? A 5-8 buck rally looks possible in the short term. I’m basing this on the content discussed in the Support & Resistance chapter. Good luck. I wrote in previous message that support team is not responding & also not solving problem, so I comment here. I’ll follow up on this, Ulhas. Is it Atr stops and super trent are same calculations ? How’s John J Murphy – TA of the financial market book? Or any specific book you want to recommend? And also what are your views on sintex plastic… Breakout from inverse head and shoulder after a downtrend suggesting trend reversal? looks like a breakout from a double bottom. It is one of the best books. I highly recommend the book! Happy reading. fibbanaci retracemnt pattern are not avl in this..
any idea about this fibbanaci pattern….. I have started my Zerodha account and I got my client id and password. But now I am getting frequent mail asking (Power of attorney ) POA document physically signed and it is mentioned that it is required to sell the shares from my demat account.On the other hand on the POA document, it is written ‘voluntary’.Can you give some clarification on this . Let me check up on the usage of the term ‘Voluntary’. However, you need to sign a POA for debiting shares from the DEMAT account, so this is really required. POA has many other clause apart from debiting share from DEMAT account. How to provide POA for only debiting share and not the other clause. Which clause are you talking about, Mukesh? why bracket order facility is not in commodity? If you think about it a Bracket Order is an algo. MCX is not comfortable with algos. Hence no BO. Do we not have Camarilla pivots in Kite charts? I am a CA Final Student and started trading 2 months ago, learned everything about TA from you and Steve nison and John j murphy’s book.. Lately i have been developing a huge interest in capital markets and I want a job in AMC’s / Investment banks.. For that which course would be better.. CFA or CMT? This question is not related to any of the concept discussed in the module… I am asking it here because i don’t have any other medium to discuss with you. Sarthak, I’d advise you to start preparing for the CFA certification. This is a long process, but in the end, this is totally worth it. CFA certification is recognized world over, and I think its one of the best if you aspire to get yourself a job in the asset management industry. I want to do swing trade as well as BTST. I use adx and candle stick but some time it goes wrong. So suggest me appropriate indicater for correct trade. You should emphasise more on CS patterns, dont stress much on indicators. I am not able to install PI on my laptop. May be i am referring wrong download link. Can anybody provide me link to download Zerodha PI ! I have seen Traders Giving Targets. But I don’t know on what basis the Targets Are Given. Is their any Indicator Giving Targets. Usually, the S&R plays an important role in here, Aditya. Ya! That’s I understood. But what If a stock has never Reached a point but The Traders are giving Target of that point. Than How they managed to give such a Target where the stock has never reached. How can I add VWAP on PI. VWAP is currently not available in Pi. here in above illustration i could make 1.5 crore with investment of 5000 rs , i just illustrated round figures for you to get an idea, whereas the actuals are having losses also , i just drawn the end result. this happens in bank nifty weekly options and just assume that i traded like the above in 2-3 months time and what would be my tax treatment, any issues i will face etc. Rajesh, you can place a stoploss and target for both CNC(Cash and Carry) and MIS(Intraday). However, the orders will be valid only for a day, it will get cancelled(if not completed) at the end of the day. I want to do positional and swing trading…. Yes, this is because all the orders which do not get executed during the day are flushed out of the system. In cash and carry whether order can be carried forward for some days or it is valid for only one day? I saw the “valuation Line” as indicator in Kite3.0..can someone elaborate what is it exactly. how is it supposed to be used. Also I noticed one anomaly…the valuation lines’ value changes as you zoom in/out in the page!! that shudn’t be happening right? I’m not sure about the valuation line, maybe I should do some reading up on this. This looks like a simple standard deviation plot – very similar to the Bollinger bands. Yeah, but why are values constantly changing?….shouldn’t the values be static….i.e values change even when I zoom in/out of the page. Because of this “ever changing” nature it becomes very confusing when I try & understand ..& perhaps look for a trade setup. The values changes because when you zoom in and zoom out, more data points are loaded, hence they change. However, let me check this once again! 2) I want to do intraday trading… When the moment I press MIS will it use only margin amount or Total amount blocked as seen in Cash and carry(suppose if SBIN is trading at 260 margins required for 10 stocks is 760.. will only 760 blocked or 2600 blocked? 3) I heard that Call and trade(Rs 20 ) are charging for intraday trading? Isn’t it true? Will intraday trading come under Call and trade? 4) Kindly make a video on All order placements, it is confusing ? 1. You can place a market order with BO by entering you buy price higher than the LTP. This will trigger a market order. 3. Call & Trade charges are charged for intraday orders not squared off only. If you square off your order before 3.20 PM, this charges won’t be levied. 1. If you don’t square off, our system will square off the position with a market order. 2. Check this screenshot on where you can find the conversion option. If we were in profit during at the time of Autosquare off… Will profit is added, or Loss? In zerodha s youtube channel.. They are not giving reply..
1)If we place MIS order(Regular)… we can place stop loss by clicking on exit order button… But how can we place Target? Can we place two exit orders (one for stop loss and one for Target ) for one MIS order? 2)Whether we have to cancel Stoploss order if target hits or it will be auto-cancelled? 1. Yes, you can place both stop-loss and target order for one MIS position. If we were in profit during at the time of Autosquare off(3.20pm).. Will profit is added, or Loss(low of the day is calculated)? Yes, your P&L will be adjusted to it. Suppose Stock price is at Rs 150.20 .. I decided to place MIS buy Limit order at 151.70 and stop loss at 150.70 and Target price of 153.20… Which order is executed first? Either Buy order or stop loss order? I am confused about it… How can we place predetermined orders? Is it possible in MIS(Regular)? You are doing great job man. Please help me to clear some doubt. I m trying with three super trend in crude oil with 10 minute chart and I feel it is working fine. Right now I am watching it, after so many bad trades. macd or adx or any other indicator and use 5 min chart will be very good, please share your view. For the streak bit, you wil have to contact their support. I personally would not like to use an indicator over an indicator. That may kind of complicate the whole business. I agree 10mins feels delayed, but as a trade off, you have looking at a slightly more stable chart. Shorter the time frame, like 5 mins, lower is the stability. Here in Zerodha … I bought 100 stocks at market order it got executed in 5 different orders… There are edit and exit option for each order separately… But I want to close my position all at once… Isn’t possible to close all 100 at once? Yes, please go to the positions/holdings tab and exit at once. I wanted to place a buy order of a script and at the time of placing order, I wanted to give two conditions. Let me explain. Say I wanted to buy Ashok Leyland in between 137 to 137.50. While I place this order, I also want to tell the system that when Ashok Leyland will reach 150.00 it should be sold out automatically, and I also want to add that, If Ashok Leyland comes down to 130.00 it should be squared off to prevent my loss. And I want to place this order with for Good till date option. Say today on 27th Feb I place this order and I till the computer that this order with all its condition to remain valid till 7th of March. My question to you, is this possible in any broker’s software? Please add Super Trend alert. It will be very helpful for options trading. We will soon have something around this. Request you to please stay tunned. Loving it. thanks to you sir. When can we say there is an uptrend or downtrend? If I am using day candles, how many continuous previous blue/red candles represent uptrend/downtrend? If there are many continuous blue/red candles and then 1 or 2 red/blue candles then again 2 or 3 blue/red candles can we still consider it as uptrend/downtrend? Mahesh, I’d look for at least 10-15 trading session, contributing to at least 5-8% movement in price. This percentage figure can be much higher for stocks. whether there is any chance of editing take profit and stop loss in BO after executed? Their margin displayed as 480 .. Will if stop loss hits Rs 400 deducted or whole 480 deducted? Kindly reply me, sir, I am confused with it? 1. Yes, you can edit stop-loss and target(profit) for BO orders after the first leg is executed. 2. Rs 480 will be blocked from your account when you take the position. Since there is a loss of 400, Rs 80 will be credited back to the account after the stop-loss is hit. Please clarify this doubt too sir.. But I never tried Limit order(Thinking order not executed)… But I want to try this… what happens if there are fewer buyers/sellers for the order at that price? will order gets executed? Suppose if want to place a BUY order for 500 quantity at Rs 100… But sellers at that price are only 150… Will 150 be executed or it executes only when complete 500 available? Kindly reply sir I want to use BO from now? 2) Can we close BO and CO orders before Target / stop loss hits? 1. While using Limit orders, if sellers are not available for the whole quantity, your order will be partially executed and the order will remain open for the rest of the quantity. What is the difference between trigger price in Nrml MIS and CO? In cover order, there is range mentioned? will order not executed if we don’t place trigger price specified by zerodha? 1.If (close- ATR) value is below the candle (pattern) low,what should be selected as SL(candle low or Close-ATR value)? 2.If (close-ATR) value is above the candle low then what can be set as SL? I understand, Venu. In fact, we will have something along these lines very soon. Before more than three months on (3 Dec 2017) below request was send. Till date it is not updated. Will it update? In general after how many days you are releasing updated version as par past experience. Please add vwap value (which is available with you) in DEPTH view. This is essential for customers. This is required on mobile which is not avaible now.Need to shift screen very time. There were many request to update software by adding features. But it is too late. Need also icon to move chart towards left & right. There was also request of adding vwap with 4 digit accuracy at any time frame. It is now available only for 1 min chart & need to zoom. Request of adding alert is pending from many days. This all required in mobile app. Please request to take follow up with developer team. Passing this to the tech team, Ulhas. This is required on kite on mobile. why we can not see VWAP chart separately like rsi,stoch,macd. Need to see VWAP separately , will help better to take decisions. Also need value of ATP in 4 digit like (245.7845). As this is available on chart but not at depth. please do this in depth also. 1. VWAP is a price indicator, hence it is formed as an overlay over the stock price chart(Just like moving averages). RSI and others have their own values and are displayed separately. 2. The Kite mobile app update will have the VWAP in the market depth too. 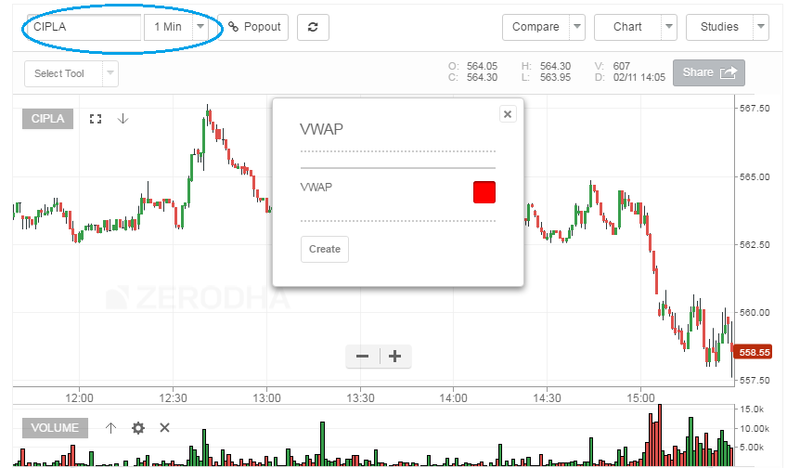 VWAP value is not available in mobile app but it is in desktop. It is only 2 digit accuracy but need 4 digit. It is available with you but not providing. VWAP with 4 digit is available on chart only for 1 minute timeframe. Charts on mobile must be continues update in the back process of mobile. Need to update in your software. Need to release which is updated & tested till today. I would like to know what should be strategy for intra trading? which indicator should we use for intra trading out of so many . I really appreciate your effort of sharing your knowledge in simple words but still am confused about the strategy during live market. Using supertrend and macd they are time lag indicators they may indicate the signal too late .Which indicator or what should be strategy to action on time if not with little delay and what should be the time frame as well. Plz if you could solve my queries. Shweta, you can use any of the candlestick pattern for trading intraday. Indicators are best used as a supplementary tool. Yes, these are lagging indicators and it won’t help you identify the exact entry and exit points. However, the point here is to capture a part of the trend and not really the entire trend. Thank you for replying. What should be time frame of the chart & indicator . And if we talk about your experience which indicator is best among the list . I’m not a big fan of indicators, Shweta. For intraday I prefer 10 or 15 mins charts, otherwise the EOD chart. I am not kyc registered.. whether i am able to open paperless trading and demat account ? Does zerodha provide e kyc process also? Kindly reply me sir.. In supertrend what should be the default settings, Day or Hour or 30 min to get best results? Default is day, but you can change this to any frequency which suits you. Hi Karthik! I have a doubt on stock splits. When I see some line charts in Google I see some sharp price drops of good quality midcap stocks to half. When I search for date of stocks split of that particular stock the date mention there is irrelevant. So can you please explain me stock split with an example? There could be instances where the data for the stock chars are not cleaned up. The data has to be adjusted to splits and bonuses. Why don’t you look at the charts in Kite? How to set ADX for weekly chart ? The same way as you’d with EOD. Use the default values. There wasnt any error message either. guide me through to resolve this issue? Thank you karthik. another query. Is there an option to get the alerts created on expert advisor on mail or on my kite account? The thing I can use only kite when I am in office(cant download on office pc. against the rules). And there are no such features on kite. so if there could be an option to get the alerts on gmail , that would help me a lot! what is the difference between Limit Bracket order and SL Bracket order as both showing same expect trigger price..
Can we use SL bracket order for placing orders like normal bracket orders or it can be used only for placing stoploss? I am trying to understand VWAP in kite(Android Version). What is the start point of weighing the trading prices in kite(Andoroid version).Is it start of a day or is it start of whatever option is opted in the screen- eg ( 1 day, 5 day or 1 month).It doesn’t appear for 1 year. Its usually run on a cumulative basis, starting of the day. Its rest to zero at EOD. I want to open online account through aadhar based.. I saw account opening process in zerodha youtube channel..
You don’t need to be KYC verified to start off with the online account opening process. You can start the signup process on our account opening page here. We need HMA colour change option is useful for all our subscribers. Please try to add at earliest possible. At present I am using Kite mobile app. Ok, will look this up. Using RENKO options of application only start from 1 minute and it erase privious printed boxes. If you include tick by tick facility it helps know correct position to enter buy and sell stock better way. Can your team can add this. Pl show some examples to do correctly and where put stoploss. 1. Is there any indicator in Pi, which shows Fractals as aligator in Kite. 1) How to change date format in chart as per my convenient format. 2) How to change scroll of mouse forward/backward(vise versa) to expand/decreasing chart as per my convenient. 2) You can use the zoom option (with + & – symbol) to zoom into the required chart area. This is available at the bottom center of the chart in Kite. All these options are available anyway, Gautam. Most of the tools are added in 1 single dropdown. Please split each tools on the Top Tool bar. So that people could use tool by selecting from the tool bar. Will pass the feedback. Thanks. What should be the time frame for Volume Weighted Average Price for intraday purpose? Normally what time frame you prefer? I’d personally prefer 10 or 15mins VWAP for intraday. With your guidance i have learnt technical analysis and have tasted both profit and loss in intraday upto Rs.3000.00 when genuine trade was there. I know how to earn profit and how to avoid losses in intraday now with ur help. Will u please guide me if this profit can be increased to more than Rs.3000.00 to let us say 5000, 10000 and more than that (of course , it can be done only if genuine trade is there). I request you to pl give me a straight answer, not a diplomatic one. Abhishek, my help will be to the extent of giving you the answers (which I think is right) when you post your queries here. So feel free to continue posting your queries here. One more small doubt. I hope u will be able to clarify. Is is really possible to be profitable after deduction of applicable charges in intraday? I have been observing that applicable charges are always eating way the profits and are invariably more than profits. The charges are to the tune of at nearly Rs.1,000.00 , if one trades with capital of Rs.20,000.00 intraday. Or should I say that intraday is profitable only if one earns more than Rs.3,000.00 intraday. I have been trading for the past 5 months nearly. Maybe, I am overtrading. Does that mean that I have to improvise my trading skills and make as fewer and refined and correct moves as possible? I am now of the opinion that trading with a capital of Rs.1,00,000.00 and making profit of at least Rs.3,000.00 at one instance only will enable one to take home some amount after deduction of applicable charges. Pl correct me if i am wrong. From my experience, keeping Rupee targets never really works in the longer term. You will fall under pressures and end up taking irrational trades. Stick to strategies and trade according to what the strategy demands. 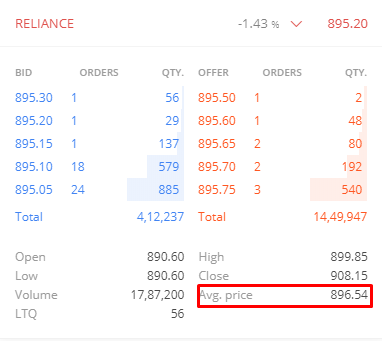 1)you are saying brokerage of 20rs or low for intraday order executed but in zerodha brokerage calculator it showing as 40rs..
2) suppose if square off by clicking x mark(market price) in a trade other than what i fixed target/stoploss.. will additional 20rs are charged for this type of orders? 1) 20 per executed order. 2) Yes, like I mentioned, its 20 for buy and 20 for sell. is 20 a fixed ? if i do with less no.of shares , will the brokerge be lower? How do you calculate , I mean percentage? 0.02% calculated as this way.. It means charges are levied twice for one order.. am I right? plz reply this… I want to start with low budget first and then I want to increase my amount (practised a lot in virtual trading).. want to practice some days in real trading first.. I believe you would have found the same values in the brokerage calculator. ya.. I too found same values.. It is really very insightful by reading your material on TA. Please keep it up and provide some more TA strategies. Also why can’t you lower your brokerage from Rs 20/- per trade to say 5 or 10 per trade? Axis Direct is offering for Rs 10/- per F&O trade only and that too Zero for intra-day trading. As most of the budding traders told above, transaction cost is eating into the profits made in intra-day trade/positional trade. suppose i place a order at 1000 with target of 1015 and stoploss of 994, stock moved to 1007.. Isn’t possible to move stoploss to 1003.. so that i can end up in profit if stock moves down.. i never tried thinking about fines (zerodha charges for improper quantity , margins etc.).. I know it is possible in BO orders as it has trailing stoploss.. but what about normal intraday orders.. Yes your pivot point calculation is different from others.. Kindly reply me what formula zerodha pi uses? I tried O+H+L+C/4, H+L+C/3 it didn’t match them. There are different ways to calculate pivot points (so both ways are correct), As both kite and pi is powered by different charting engines and hence they differ. What is the best way to adjust options “iron condor” strategy if the market is moving in one direction? please clarify me with examples. If you are talking about a hegde, then you will have to note the direction of the market and initiate a futures position to match your P&L. I happened to see some videos on you tube on Elliot waves. Seems complicated but interesting. Any plans of including this study here in varsity? Ne books or materials that you could suggest? Its been on the list of things to do, Shyam. Will try and do that sometime this year. Thanks. *. Had constructed price action zones based on my readings from varsity, and the lower zone is actually a major support zone if you look back in the chart, not showing in the screenshot though. *. CMP was at the lower zone, and so was the stochastic and I was bullish on it because the zone was time tested and not broken, at least not recently. *. The A candle formed. A hammer if I am not mistaken. There was a volume spike above average level, D, right beneath it. So a hammer after a downtrend at a support level with a volume spike indicates a reversal, but I waited for confirmation. *. The doji right after A suggested indecision, so I went ahead and placed a SL-BUY order at the high of the doji, which was hit by the bullish marubozu candle B (not exactly a marubozu though). *. So blue line is where I bought and the red line was my SL which is right below the low of the hammer (with a buffer of 1-2 ticks). The green line was my target as it was the next immediate price action zone, above. Also, I kinda felt that the price is ranging between the two zones. The R:R was 2.6 and was very satisfying for an intraday trade. a) Is my approach right? Did I miss something? Should I have waited for more confirmations? b) Had you been in my place, how would have you approached this trade? Would you have taken the trade? If yes, then where would you have taken the trade? c) What other factors would you look for here? Do we need to look at any non-technical parameters before initiating a commodity intraday trade such as this? As always, your insight would be highly appreciated. I am glad you posted the video. Had seen this long back and actually had some queries..
1. Let’s say we have calculated the absolute daily volatility value of a particular equity in 15mins interval to say, Rs. 5/-. Now does this mean that the price of the shares would fluctuate +-5 from the CMP or from the O/C/H/L of the day or from the O/C/H/L of the candle that’s being formed? 2. If we placed volatility-based SLs and Targets, the R:R would always be 1:1 right? Is that advisable? 3. Can we just use the built-in ATR study of Kite to determine the volatility at any interval and skip the whole volatility calculation part (the way you’d mentioned in the video)? Or they are two different things? 4. This is off-topic. When we know that we are trading a range, then is it alright to ignore waiting for above-average volume spikes when price reaches the upper or lower level of the range and just take a trade based on a recognizable pattern/candle forming at either of the levels? 5. Would you say that a resistance level which has turned to a support or vice versa is a more reliable/stronger price action zone than the S&R that we would plot otherwise? 1) You are comparing two things here – daily volatility versus 15 mins volatility. Both could be different hence you need to convert daily vol to 15 mins vol. I’m really not sure how effective this would be. Anyway, to answer your question, its on EOD OHLC. Thanks for responding. I have an issue though. I know this is not your department but I am unable to get any response from the Zerodha support team. They have opened a ticket and all but I can’t see their response at my end. The thing is, when I look at the SILVERMICAUG2018 chart, I see today’s candle (daily time frame) at a certain place but when I select continuous data from the display menu, the candle redraws itself (again in the same daily time frame) at a different place. Had send the screenshots to the support team but, as I said, either they haven’t responded yet or I am unable to view their replies…I am posting the links to the charts here. If you could kindly look into this or kindly let me know whom to contact so as to escalate the matter, it would be of great help. Hassan, I believe Arockiya from our charting team has resolved your query over the phone. Is there a way I can share the screenshot of a chart with you? Wanted your insight on a trade I took. Tried uploading the file to my drive and sharing the link here but guess the forum doesn’t allow links in the comments. Any other way to share a screen shot with you? Thanks. I saw the image and responded to your query. Why vwap is not in pi? Why is it so difficuilt to put it in pi? or have you guys stopped working on Pi. I see there are no updates on pi for long time now? Pi use a 3rd party charting engine, Vinay. So the inclusion should happen from their end. I’ll check if this can be done soon. Thanks. Supposing in bank nifty i am using super trend .what shd be the period and multiplier. I am using 15 min chart. SHd i keep the default (7,3) or shd i change this for generating more signals? Shyam, I;d suggest you use the default parameters for this. can we use average trading range for banknifty and nifty index? or is this applicable only for stocks? Yes, you can use this over indices as well. The movement of banknifty is huge . How shd i interpret this? Which part is confusing you, Shyam? I was checking ATR for ACC. It was 9. Current stock price is 1339. Does that mean it will move in range between 1348 or 1330? When I checked the charts in kite there was a 40 point movement in this stock on 29th. AM i interpreting this wrongly? Yes, ATR gives a volatility based range for the stock or index. In this case, it is 9 and yes, 1330 to 1348 is the range. Possible Shyam, remember there are no guarantees here, just probabilities. Now to the issue…I was looking at SILVERMICAUG2018 contract (default daily time frame, non-continuous data) and yesterday and today’s candle at a specific position but when I chose for continuous data of the same contract on the same time frame, the candles just shift their positions. \the OCHL all gets redrawn and at different levels thus making it difficult to take a trading decision. I am currently short on this contract and I am unable to decide on my target. I am not posting the links to the charts else the comment will not be posted. Could you please look into this? I know this is not your department but then I am not getting any response from the support time…all I have is a ticket no. : 20180702577545. Any help would be highly appreciated! Thanks. You have produced such good content; Kudos to you. Now, where can I find detailed information on every tool (i.e. drawing tools and indicators). Thanks, Madhuri. Most of the important indicators are already covered in this chapter. Is there anything, in particular, you are looking at? 1) I am an intraday trader. Is it required to have a demat account? As intraday shares are squared off on the same day itself, moreover it won’t go into demat account. 2) I am prepared to open an account through online… on last we have to sign and send demat form, within 7days..what will happen? If it is not reached within 7days, will the account be fortified? 1) Yes, because at times you may be required to take delivery of shares (think of a situation where you are unable to sell owing to liquidity situations). 2) No, it wont. The physical document is the POA of your DEMAT. The sooner you send the better it is for you. Good luck. How long it will take to get active account,if I open account through online? Is it possible to start trading(intraday) immediately after opening an account? or I have to wait till my demat account is linked ? How can I know whether demat account is linked to my trading account or not? will I recieve any confirmation message? What are requirements/conditions for Margin Trading? You need to ensure you have the required margin amount before trading. You also need to be aware of the risk you are taking while trading on Margins. SINCE I’M NEW TO TRADING, I’M LEARNING CHART IN INVESTING.COM WEBSITE. OVER THEIR WHY ADX IS SHOWING SINGLE LINE IN INVESTING.COM WEBSITE? I ALSO SAW SETTING BUT NO OPTION! WHAT SINGLE LINE SPECIFIES ? I’m not sure, Chanu. Suggest you check with their support desk. Thanks. well, it might not be in investing.com, maybe only in zerodha charting. 2 out of the 5 questions will randomly pop up at the time of login in. This is how 2-factor authentication works. Unfortunately, you cannot keep 2 questions constant. Today is an exchange mock trading day. You may receive live ticks and your orders may go through. These are dummy transactions and are wiped automatically the next day. I am seeing occasionally these message during weekend days… what is this? Is it a practice one? whether we can place orders? Mock trading is mainly for the brokers to test their systems. The ticks during mock trading are wild, does not represent real market circumstance. So I guess there is no point participating in it from a learning perspective. Hi Karthik – I just finished getting to know the Introduction & TA and I must say that this is one of the best insight to stock market and I’m going to share this on FB for others to know.. Blow away by your simple explanations, Kudos..
One clarification from my side while reading through this sentence (Total VP = This is a cumulative number, which is got by adding the current VP to the previous VP) – I’m unable to identify the previous VP , can you clarify pls. So the current Volume * Price data gets added to the previous Volume * Price and a cumulative number is generated. See the table, it has the calculation. Thanks sir.. In chapter you have mentioned for most of the TA to look at the candle stick pattern at 3:20pm while the market closes at 3:30pm, is it really possible to do a intraday trade within that 10 mins time interval (or) Am I missing something in here..? These are not for intraday trades, you look at whats panning out and take a positional trade. Looks like some confusion, what i meant is the timing of 3:20 pm is mentioned in candle stick patterns from module 5 to module 10.. Yes, at 3:20 PM you take a call on how the price action is panning out and decide if you want to initiate a trade or not. You should also be in a position to identify the candlestick pattern. Thanks for initiating the account opening process at Zerodha. We have received your PoA declaration today and will get back to you soon with the status. Do get in touch with your Sales Manager – Deepa ([email protected]), mobile: 9176812020 or call us back on 080-49132020 in case of any further queries. Lastly, we appreciate your valuable feedback, please do let us know about your account opening experience by writing to [email protected] and [email protected]. Will you reply to me?